First off, I'd like to apologize for the poor photo quality of this post. The camera is on loan for a few days, but I got impatient and wanted to post these shirts, so I borrowed an iPhone to take the pictures! And as if the photo quality wasn't enough, I had to "draw" the instructions. Have you ever tried using the pencil tool in Photoshop?? It's like being 5 again. Anyway! 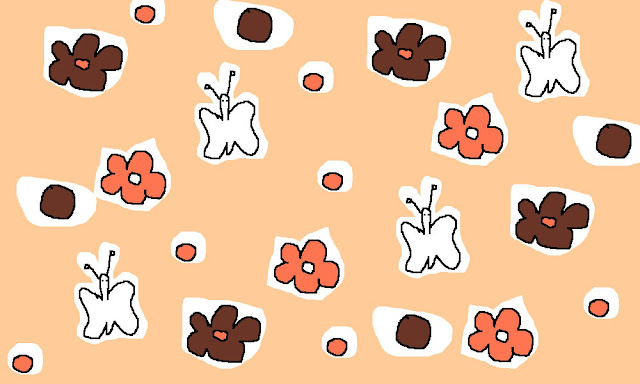 Start out with a plain t-shirt, and some floral print fabric. 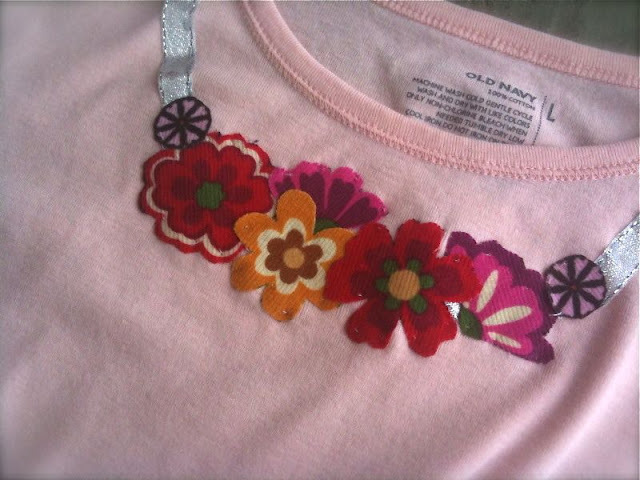 Cut out a few of the little flowers from your fabric and set them aside. (if you're using felt, cut a squiggly circle in three sizes for each flower.) Then find a coordinating ribbon in a narrow width. My drawing says 1/4", but now that I think about it, it was probably more like 1/2". 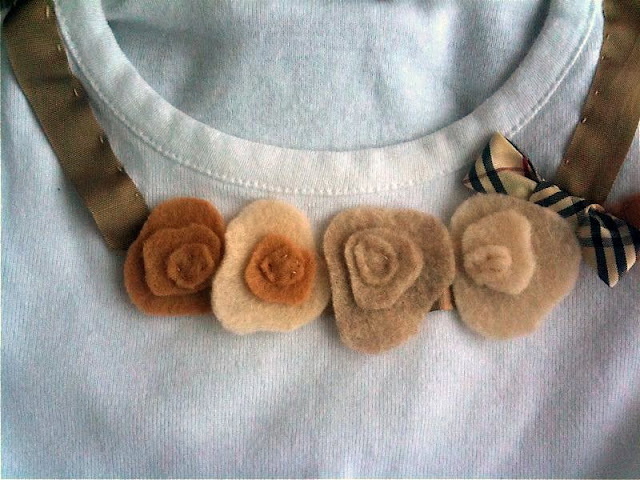 Pin your ribbon to your shirt in a way that looks necklace-y to you. You may want to do this while wearing the shirt to get the right length. 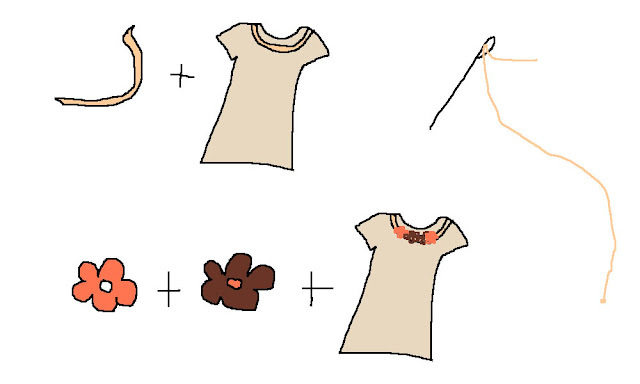 With a needle, and thread that matches your ribbon, hand stitch the ribbon onto your shirt. 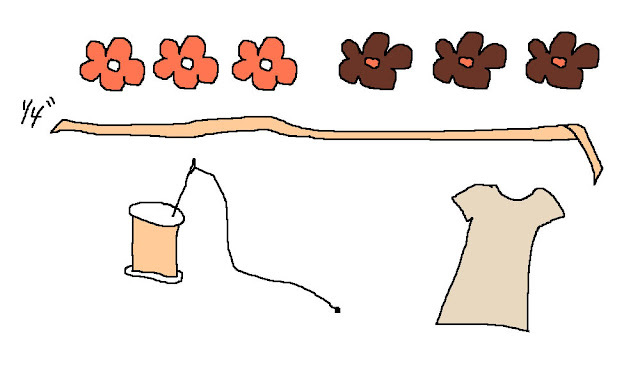 Then position the flowers where you'd like them and stitch them on as well! You can use some Heat Bond or something if you want to help them stay put while you're stitching. I'm not sure that I'm head-over-heels in love with the one I made for myself (must be all the color!) but I will totally still wear it. But I love how Paige's turned out! She wasn't enjoying the photo shoot as much though, because she wanted to play with the iPhone. Life's rough when you're 2! I'd love to do another one for myself in more neutral tones! On a totally different subject, it just doesn't feel as much like Christmas to me this year, and I think I've finally figured out why. It's such a sad, sad, pathetic reason, that I'm not sure I should really be sharing it, but, meh. I don't live near a Target!! Every year, I've gone to Target 3,000 times to look at all the mittens, stockings, ornaments, good grief, even the giant cardboard presents hanging from the ceiling make me jolly! I'm rambling now, so I'm going to go. Love your blog and that necklace to bits, and yay for Target, I don't know what I will do without! Happy Holidays too! Way too cute, I cant wait to make one! You're so funny! I love how honest you are! Target! :-D Today is my birthday and I'm actually going to Target! The shirts are adorable and your daughter....good grief! Could she be any cuter?!!!! 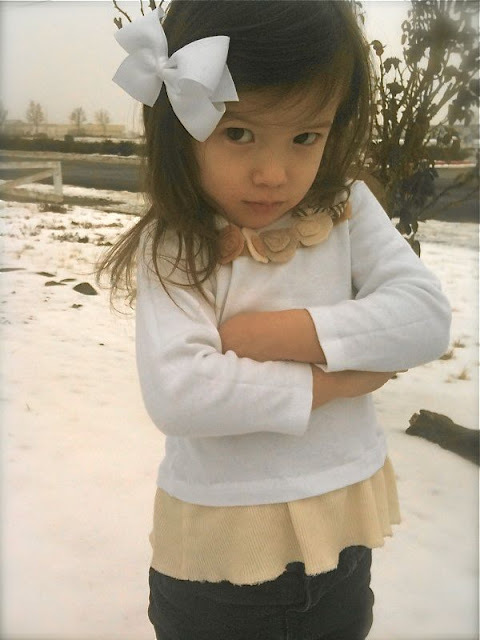 Even her mad face is picture-perfect! I really like the felt necklace one. BYW, I'm a Target freak too! It is fun just to go look at all their cool things :) And, guess what? I think I'm going to make you and a few other blog friends a little gift, or two. The brown and pink coffee cozy is yours! (It was actually an extra one, and I totally thought of you when I put the color combo together). I'll be emailing you for your addy :) Merry Christmas! I'm having the same Target withdrawals. We just moved to a small town that is 50 minutes from the closest Target. Life just isn't the same. it feels like I live at Target sometimes. Now THAT'S dedication!! Your photoshop illustrations are awesome :) What a super cute idea, and I love how your daughter's turned out! The felt one with the plaid ribbon is simply fantastic! 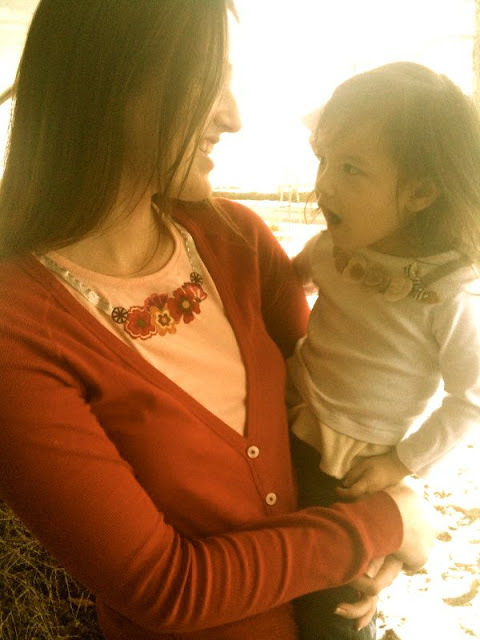 Your little babe is a doll...even when she's poutting in her super cute shirt! MERRY CHRISTMAS & I hope you get to spend as much time in Target as you want, every girl deserves that! I remember I used to love to go to the mall just to look at all the lovely decorated trees. Growing up, the mall near us had an entire section devoted to all types of decorated trees. This in addition to all of the stores with their decorated trees. I like going to Target for this very reason. It's like Christmas in a box that takes me back to those happy memories. enjoy your Target fix. I just may have to pop in to one today as well! AHH! I too have recently moved about an hour away from Target!! It's been a hard year away from my love, but a blessing in disguise, as i know i spend far less money when i can't go there 6 times a week :) Every time i get to go I am also unnaturally happy about it - it's all i think about for days!! I justify my intense love for it by telling myself and my husband that at least i'm obsessed with Target and not some place really expensive like Nordstrom! I like your bright necklace (although I'm a neutrals girl, too.) Paige is cute even when she's annoyed. LOVE this idea. I'll be trying it out for myself & for my baby girl. 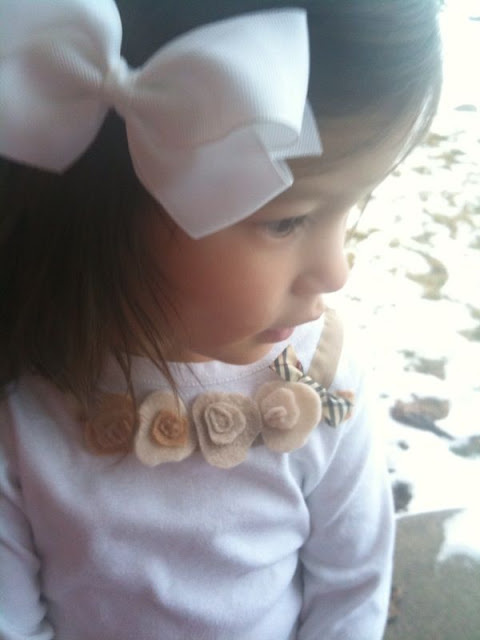 Built-in felt flower necklace sounds like a great (and super cute) drool catcher. Also, I know what you mean about Target. Something about that place always makes me feel festive when there's a holiday. I am very attached to all of the conveniences of the big chain stores, too. Let us know all about your trip to Target. I actually really love the hand drawn instructions. They're so charming! Cute shirts too! Merry Christmas! Very cute and I think a great way to cover up some stains on shirts. I just moved close to super targets and Im not impressed. It's as good as a regular Target just Hooj. I'm happy u get to go though! you are so funny girl! i hope you had a great trip to target! i love that place! your shirts are TOO cute. REALLY. i am LOVING felt these days... so simple and easy to work with. ok... and paige's grumpy face??? SO CUTE!!! you gotta give her a big hug for me. thank you so much disney. you have been a blessing to me from a far! p.s. i LOVE, LOVE, LOVE the hand drawn tutorial!!! it came out REALLY cute!!!! This is utterly delicious! Love the faux flower cluster necklaces!! I hope you had a blast at Target!! I lived with out one for 2 years there was not a one in the state of Alaska untill 2008 It was a happy happy day!! I will defently have to try this cute shirt idea.. I love all your creative fashion funess. I just found your fun blog and I am trying to soak it all in.. These shirts are both super cute! I may have to make one in the new year when I have so more time! A pequena ficou um doce mais doce ainda com esta guirlanda no pescoço! fofura! I totally understand about Target. They have the best, cutest stuff there. Enjoy your day trip! this is great - also enjoy the picts of the pouty little girl ;) i have 3 of my own but they are not little anymore. We've already talked about this I think, but I have an unnatural affection for Target. I know that this stuff shouldn't be that big of a deal, but it would be R-O-U-G-H on me to not have a Target nearby. Hope your little adventure was glorious, that you strolled through all of the aisles slowly, that you perused the clearance end aisles and that it was fabulous. 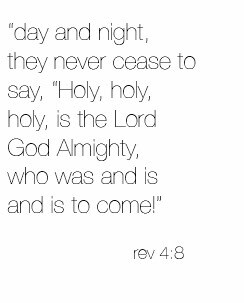 What, oh what, are you going to do on the day after Christmas? Hi Disney.. I really love your blog! You have given me so many great ideas & much inspiration! 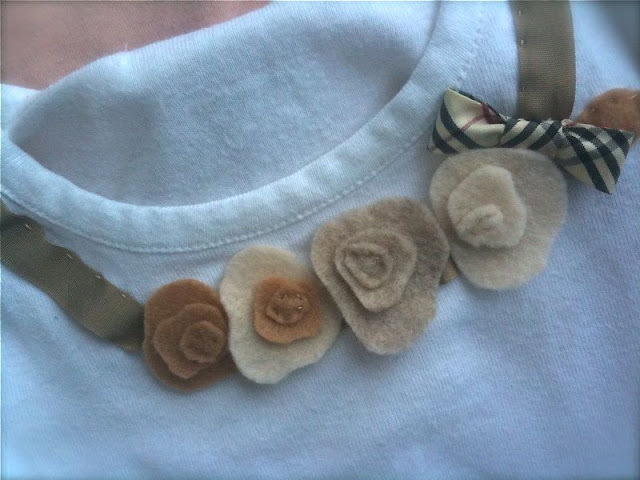 I have become obsessed with these little felt flowers..I have put them on hair clips/headbands/Pacifier clips.. I want to try them on a shirt, (Your version came out too cute!) but I'm not too sure how they will come out after it's washed/dried. What has been your experience with this? Any tips?